Waking up in Paris has always been in my list. There is just something about Paris vibes that makes you feel very special and let's say...chic! Not to mention the picture perfect streets. I don't mind getting lost in the small streets in one of the fashion capitals in the world, because all the buildings are just exquisite. I love the morning smell of freshly brewed coffees and croissants in every corner of the city. Mostly, I love how Parisian women and men dress. They look very fresh and effortless, even with just a pair of ripped jeans and plain white t-shirt. Therefore, while I am in the city, I decided to wear something that screams Paris. And I can't think of what can be more Parisian chic than a turtleneck (or stripes) top for the windy weather. Talking about Parisian style, don't forget to add the magical Chanel touch. This Chanel Boy is just better than what I imagined in terms of the color and size. Just amazing! 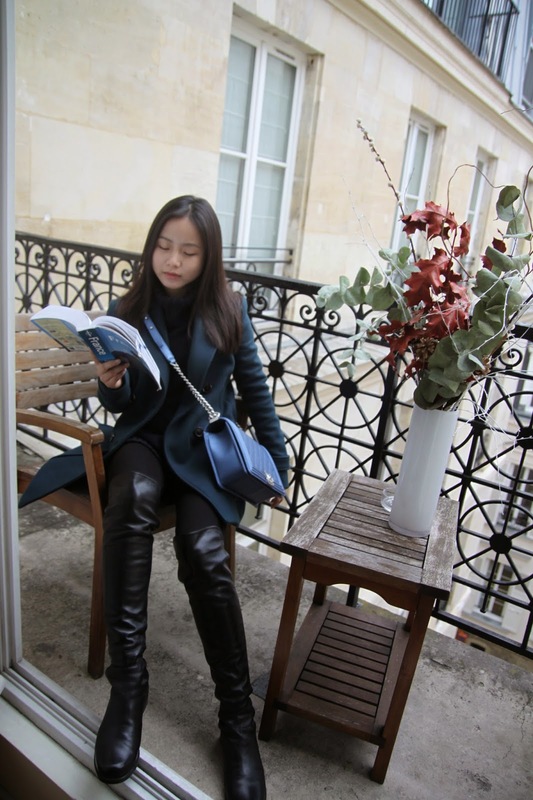 When in Paris, I stayed in one of the most beautiful apartments I have ever been. It is located in a stylish Haussmannian building and what's more amazing is the prime location, just 3 minutes walk to the famous Lafayette and Printemps. Now you know what I am talking about!